If you are looking for a good, thick and delicious hot chocolate recipe – this is the one! I have tried several recipes until I found the perfect one and I am sticking with it. 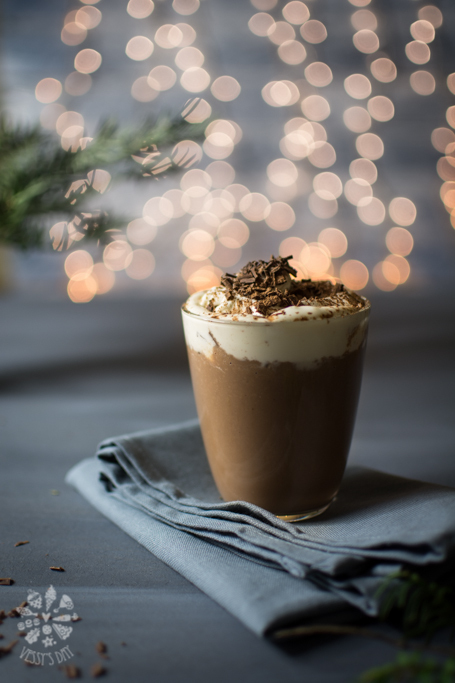 This hot chocolate recipe is not one of those “ready in 5 minutes” using a macrowave recipes, but it is totaly worth the 15 minutes it takes to prepare. As this hot chocolate is sweet, thick and rich, I believe that it could be easily served instead of dessert. *Add any kind of your favorite flavor – cinnamon, hazelnut, vanilla, mint to the milk and have this hot choolate exactly as you prefer it. In a small saucepan heat the butter, until it melts. Add the corn starch and cocoa powder. Stir until they dissolve in the butter. Add the milk and let it heat up. Just before it begins to boil, turn the heat down to medium-low and add the chocolate. Stir frequently for 5-7 minutes or until the mixture starts to thicken. The hot chocolate will become thicker as it cools off. Serve hot or cold on ice.